'999' mobile call to Cumbria police from a concerned informant regarding overdue walkers. The team leader was gathering details from the police when the overdue walker turned up at Seathwaite safe and well (He was supposed to be in Wasdale where the car was parked). Callout cancelled with no team members deployed on the hill - hence recorded here as an (a) [team leader involvement] but not logged as an official team incident. '999' mobile call to Cumbria police from a walker who came across a 51 year old male who was laying down. He was very cold, confused and had been there overnight from the previous day. 16 team members were deployed on the hill. The casualty was warmed in a bivvy tent and stretchered down the mountain via Lingmell nose to Brackenclose where he was met by an ambulance and taken to West Cumberland Hospital. Incident closed at 9.00 p.m. - Had the walker not been found by the passing walker he would have struggled to survive another night with no shelter or dry clothing. He was not reported missing by anyone. '999' mobile call to Cumbria police from walkers who were lost after descending Scafell Pike. The team leader established that they were located at the corner of Piers Gill where it comes up against Straight Gill (less than 50 metres from the incident 72). He advised them to retrace their steps to the wall at the head of Piers Gill and turn right which would take them back to Brakenclose via brown tongue. The couple phoned the team leader up at 6.00 p.m. when they were down safely. Incident closed at 5.30 p.m. and not logged as an official team incident. Paged by the Police following a call for help to locate a group of 5 adults and 1 teenager who had set off that day "to climb a mountain somewhere in Eskdale or Wasdale". They were all staying in a guest house in Eskdale. As the informant, the wife of one of the walkers, could not give any more information and did not know the details of the cars they were in, the team were unable to take further action (noting rescue N0. 72 was in progress). The police advised shortly thereafter that the group had turned up safe and well. Incident closed at around 7.30 p.m. Not recorded as an official team reportable incident. Paged by the Police following a '999' mobile call reporting 2 teenage male walkers who were somewhere near Scafell Pike, overlooking a river and stick on a rocky ledge. One of the walkers had injuries. Due to the uncertainty of location the team leader requested additional manpower for the search and eventual carry off. Duddon & Furness MRT, Cockermouth MRT and Keswick MRT were called in to help with the search. Early into the search the advance came upon a group who were aware that the fallen walker was located in Piers Gill. One of the walkers had fallen 50 ft down a rock step in the bottom of the Gill and landed on his back. His only injuries were bumps, bruises and sore ribs. His only evacuation route was to be hauled up a 300 foot rocky gulley. The four crag fast walkers had to be roped out from their location, belayed from above as they traversed out of their precarious location and then back up Piers Gill to Lingmel Col. Weather conditions for the rescue were severe with low cloud and driving rain. - the following extract from the press release summarizes the incident which closed at 1.00 a.m. on the 27th with all the missing and injured persons accounted for. Wasdale MRT were called to assist what they thought was a party of 2 fell walkers who were stuck on a ledge overlooking a river on Scafell Pike – no further information! As the incident unfolded it became apparent that the incident involved 6 fell walkers, 2 separate parties of 3 who had joined forces after losing the path in thick cloud and heavy rain. They had strayed into Piers Gill, an accident black spot in Wasdale where 4 of the party became crag fast, one fell some distance into the bottom of the gill and the sixth managed to make his way out where he met the rescue team who were searching for the 2 “reported|” missing walkers. After a very difficult and technical extrication all 6 walkers were escorted back to the valley. Miraculously, apart from a few bumps and bruises all were uninjured. Taken to: No hospital treatment needed. Further information: Six very lucky people. Piers Gill contains a severe rock climb. Paged by the Police following a call regarding 3 missing/overdue walkers in the Kirk Fell area. The Deputy Leader made the decision to take no further action at this time but to wait. The three missing walkers turned up safe and well at Seathwaite at 8.06 p.m.- No further action necessary and the incident log closed. Recorded as a (b) incident as no fell response required. Paged by the Police following a '999' call for missing climbers who had spent the day on Scafell. It was clear night and the team leader decided to wait to see if the missing climbers would turn up. The climbers turned up safe and well, one hour later at 9.27 p.m., incident closed with no team members on the fell. Paged by the Police following a '999' call from a 34yr old male walker from Wakefield, Yorkshire who was stranded on the summit of Pillar. Weather conditions were rain with low cloud and poor visibility. Despite attempts over an hour to talk him off the mountain using map and compass and his GPS, the team decided to mobilize at 2.50 p.m. Very few walkers were out that day due to the poor weather so it was unlikely that he would be able to buddy up with someone descending. 10 team members attended and reached him on the summit at 5.00 p.m. Incident was closed at 7.00 p.m.
Paged by the Police following a '999' call from concerned mother from Oxfordshire whose husband and 5year old son had left Wasdale the previous day to camp overnight on Scafell and had not reported in. The fathers car was still parked at Wasdale Head. A small group of 4 Team members were already on Scafell Pike that day so were redirected by the Team leader to investigate Hollowstones. A father and son fitting the description had been seen in the Sprinkling Tarn area so this area was also targeted for a search. The overdue father and son turned up safe and well at 1.45 p.m. Number of team members involved 6. Following a serious 4 vehicle road traffic accident on the A595 at Calderbridge, the team leader and team doctor (at the rescue base at the time of the accident) attended with advance vehicle and casualty care equipment. The road was closed for 6 hours. One of the drivers in the accident did not survive his injuries. 2 team members involved and recorded as an (a) - this accident also resulted in incident 69 (b) see above. At the same time as incident 69, the team were asked to assist Keswick MRT in a search for another 2 fell walkers who were several hours overdue. After a long search in atrocious weather they were found at 3.30 a.m. in Upper Eskdale and escorted to the road before being taken back to their hotel in Keswick by Keswick MRT vehicle. Duddon and Furness team and SARDA (Lakes) assisted in both searches. Around 35 mountain rescuers were involved and the rescue lasted 7 hours. 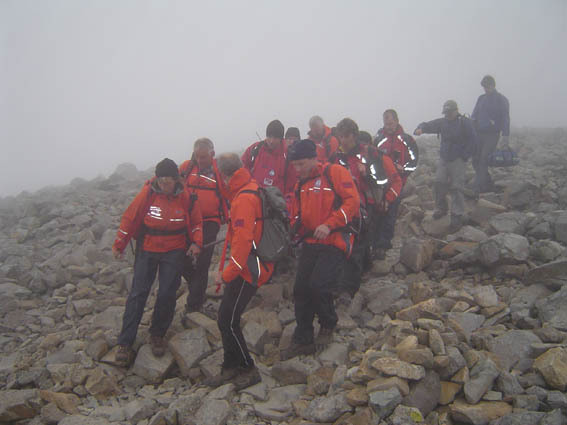 The police paged the team to search for 5 teenagers who had reported themselves lost on Scafell Pike. They were quickly located, in very heavy rain, near the bottom of Scafell Pike, having lost the path back to their car in Borrowdale. They were transported back to their accommodation near Bothel in one of the team’s vehicles, rather disappointed that they had not been picked up by a helicopter. There were 15 Wasdale team members involved and this incident was closed at around 1.00 a.m.
Whilst the team were training with RAF Boulmer at Wasdale Head, a '999' call came in for a male climber who had fallen 30 ft off a climb on Kern Knotts, Great Gable. He had sustained chest, facial and head injuries. The team quickly mobilised the RAF helicopter to assist. An air ambulance that was already on the way to the incident was stood down due to the steep nature of the ground at the incident site. The casualty was treated by the RAF winchman and flown to West Cumberland Hospital. The three team members on board the helicopter were not required and taken back down to the valley bottom where a further 11 team members were standing by with additional equipment. The casualty was later taken to Newcastle. In all, 17 team members were involved in the incident and the incident was closed at around 7.00 p.m.
Whilst the team were returning from incident 66, they were flagged down by a driver who had driven his van down a lane and slid off the track into the side of the track. He asked for assistance. The vehicle was towed out and he went on his way, happy that he had not need to call in a local farmer. Recorded here for interest only and recognition of support to the community at large. Further photographs added from the walkers involved in incident 64(a) and other walkers who subsequently have been to the location. Police callout to investigate a sighting of a possible body located on Lingmell Crags. The informant initially gave a description which put the body on the Crags above Piers Gill, viewed from the Corridor Route. However, once the team were on the hill, more information was obtained which put the sighting on the northern crags viewed from the Styhead Path on the Great Gable side. Although it was suspected to be a coloured bag by the team leader, a thorough search was needed to establish that no one was injured. The bright orange survival bag was eventually sighted and located but did not contain a person. The bag was removed off the mountain and incident closed at 8.00 p.m. 15 team members were involved in the callout which was a well intentioned '999' which could have been a lot worse. Team called to assist a female fell-walker who had a suspected torn calf muscle and was unable to walk off the fell by herself. She was quickly located on the Corridor Route, just off Lingmell Col and stretchered down to Wasdale. The injury did not require hospital treatment but was very painful. 15 team members attended the incident. The injured party were very well equipped and experienced and would have wished to get themselves off the mountain unaided which was impossible with her injury. Two walkers were reported to be stuck on the Screes above Wastwater. A small team were sent to establish their location. They were found quickly, not in any danger and not far from the pumphouse end of the lake - they had just run out of daylight and had no lights - more details to follow. A party of two walkers became disorientated on the summit of Great Gable. They used their mobile phone to call '999' for assistance. Communication was very difficult and they were unhappy about being given directions over the phone even though they were standing at the summit cairn facing the remembrance plaque. The team leader reluctantly agreed to go on the fell with another team member plus the base opened up. The conditions were not bad and there was no risk to the pair of walkers. Whilst the rescue party were making their way up the mountain the lost couple phoned in to say that they had managed to make their way down via Aaron Slack to Styhead Tarn and were heading for Seathwaite. Incident closed at 7.30 p.m.
Police paged the team following a '999' call from the wife of a 68 yr old male walker who had climbed Scafell Pike and was lost making his way back to Windermere. He was contacted on his mobile phone and his description put him at the top of Piers Gill. Weather conditions and visibility were good so the The Team Leader tried to talk him off the mountain but he was exhausted and very reluctant to move. A limited callout was made and after encouragement, food and the provision of lights he was slowly 'guided' off the mountain to Wasdale as any other destination was judged beyond his reach. 5 team members were involved. The incident was closed at 11.00 p.m after dropping him at a local hotel for the night. Police paged the team to search for a missing 60yr old male walker from Wirral in Cheshire who was up on holiday and failed to return to his accommodation. He was walking in the area between Seatallan and Middle Fell. 12 Wasdale MRT plus 4 SARDA search dogs were involved in the search - he was eventually found on the fell between Blengdale and Guards Head at 2.05 a.m. He was able to walk off the fell. Incident closed at 4.00 a.m. The team were called in to search for a missing father and son (12 yrs) who were due back at Seathwaite at 4.30 p.m. from a walk up Scafell Pike via the corridor route. The wife raised the alarm from a phone box at Seathwaite. Duddon & Furness team were covering Eskdale with Keswick MRT (6 team members plus 2 search dogs) covering Styhead to the Pike. Team leader waited until 9.30 p.m. before calling the Wasdale team in on a full callout. 15 Wasdale team members were involved in the search. The missing persons eventually turned up safe and well at Wha House farm in Eskdale at 11.45 pm. The Wife drove round from Seathwaite and the family drove back to Newcastle. The incident was closed at 1.00 a.m. the following morning. The team were paged by the police to respond to a female who was crag fast in a quarry near Bigrigg, Egremont. Clints Quarry is an overgrown disused quarry with steep sides. The lady had been walking round the quarry when she fell down the bank but her fall was arrested by the trees. She was quickly made safe with ropes and brought safely up. 16 team members were involved and the incident was closed at 7.45 p.m. Call at 23:20hr from Cumbria Police. Informant was Police in North Wales which caused some confusion. They had a police team doing 3 peaks and reported a male walker with a broken ankle in group also doing the 3 peaks by the slabs just below the summit plateau on Scafell Pike. He was a large male in his 30's. Conditions were warm, still & dry with good visibility but dark. A doctor was already on scene ( turned out to be his wife). Duddon & Furness MRT were called in to assist with the carry down. Injury was an unstable fracture of left ankle. The casualty was given analgesic and stretchered off the mountain. He was taken to West Cumberland Hospital by ambulance and the incident was closed at 5.00 a.m.
Called by Police. Report of a camper wagon off the Hardknott pass road on the Wrynose side. 'Driver could not get out for fear of vehicle dropping over edge'. The team were asked to stabilise the vehicle. Landrover with winch was dispatched with crash gear and stakes. The Fire brigade were also confirmed as tasked but it was believed they would have difficulty getting to the location. Police arrived on scene and reported that the situation was not as bad as first reported so the team were stood down. The team were called to rescue a party of two walkers on Scafell Pike. A 20yr old autistic male along with his carer were benighted and lost. Good telephone communications with the lost walkers established that they were most probably in the Hollowstones area. A limited callout was made but when the team got to the individual at around 12.45 a.m., it was decided that a full callout was needed to stretcher him down the mountain as he was moving so slowly. He did eventually mange to walk down himself but very slowly. The back up group remained in the valley bottom. 10 team members were involved and the incident was closed in the early hours. The team were paged by the police following a '999' from a three peaker support vehicle in Seathwaite. Two male three peakers (42 and 22 yrs) had set off from Seathwaite at 5.00 p.m. to climb Scafell Pike after climbing Ben Nevis earlier that day. They did not return so the call was made. Their intended destination was Wasdale Head. The team leader decided to wait until first light and then did a full team callout at 7.15 a.m. As is usually the case the missing persons turned up safe and well at 7.30 a.m. having taken a wrong turn on the hill and ended up at Brotherikeld at the foot of Hardknott Pass, Eskdale. Not logged as an official incident by the team as no direct involvement. The team were paged by the police regarding overdue walkers. The walkers turned up at 11.05 p.m. safe and well. Incident closed and no further action taken. The team were paged to search for a missing girl. Call originated via police from a gentleman who had been up Pike and descended the Corridor route back to Seathwaite, Borrowdale. Granddaughter had gone off in front on way down and Grandfather lost contact near Piers Gill at ~13:30. She was not at the car when he got there. Persons he met ascending whilst he was descending had not seen her. The team were paged to rescue a male walker in his early 60s with an injured knee. He along with his son and nephew in their mid 20s had climbed Scafell Pike from Eskdale and whilst descending his knee was causing him sever pain and he was unable to walk. He was high on the Scafell plateau only a few hundred metres from the summit cairn. He was carried down to Brackenclose by stretcher via Lingmel Col and Lingmel nose. There were around 18 team members on the callout and the incident was closed at 8.30 p.m. The team were paged to assist 4 young male walkers who were lost on the summit of Scafell Pike. A limited callout was made and 4 team members searched the summit of the Pike and found the lost walkers at midnight above Chambers Crags, a hundred meters to the east of the summit cairn overlooking Little Narrowcove and Upper Eskdale . They were cold in low cloud but fit enough to walk back down with the team. Incident closed at around 3.00 a.m. The team were paged by the police to deal with a mobile '999' on Scafell. A lone male walker was descending back to Boot in Eskdale on a due south bearing when he came to crags and became unsure of his location. He was in low cloud and judging by his described location was probably above Horn Crag on Slight Side. The team leader was getting more information when 3 other walkers turned up at the same location and were happy to walk him off. Incident closed at 3.40 p.m. No team members deployed hence not recorded as official rescue. The team were called to help the Police search the River Ehen, Egremont following the discovery of personal items left next the riverbank. Around 15 team members were involved along with a SARDA dog handler and members of the local canoe club. Both sides of the river were scoured upstream and downstream of the location of the personal items. Nobody had been reported missing and nothing further was found in the river following the very detailed search of the banks and the river itself. The incident was stood down at 1.30 p.m. pending the police receiving any further information that might help solve the mystery. A limited call out for an injured person on Buckbarrow. A 36yr old mother accompanied by her partner and three children were descending Buckbarrow when she slipped and broke her ankle. The Partner ran down to the nearest farm to raise the alarm. Only a limited callout was necessary as the lady was managing to get down the mountain under her own steam, sliding on her bottom. 5 team members attended with a further 5 back at base. She was given analgesic and her ankle was splinted before being driven to west Cumberland Hospital in the team vehicle. Incident closed at around 10.30 p.m. The team were paged by the police to respond to a call from informants at Boot, Eskdale. A 60 years old lady had sprained her ankle about half a mile above Boot on the main path to Burnmoor Tarn. She was reported to be feeling quite faint. Whist team members approached from the Burnmoor end others approached from Boot. The lady was eventually located not far from Boot making her way down very slowly with another male walker. Her ankle was examined, splinted and she was taken to West Cumberland Hospital in her own car for further treatment. Around 10 team members attended and the incident was closed around 5.00 p.m. The Wasdale group of 6 were returning to their vehicle at Stockley Bridge. Just as they arrived at Stockley Bridge, Keswick MRT were paged by the Police to attend to a group of 4 male walkers who were lost and had given a grid reference which placed them on top of Seathwaite Fell. The Wasdale group of 6 about turned and searched Seathwaite with nothing found. The search continued and covered the Esk Hause / Angle Tarn area due to further information being received by text messages from the party. They were eventually located on Glaramara at around 9.00 p.m. Weather was very poor with cloud down to 1,500 feet. The four walkers were walked off the fell to Seatoller where they caught a taxi back to Langdale. Incident closed at 11.30 p.m. 7 Wasdale team members on the fell plus 2 or 3 Keswick team members on Keswick Control. Whist the team were dealing with incident 47, they were called by the police to attend to an injured walker on Mickledore ridge, between Scafell Pike and Scafell. A number of team members including team doctors already on the fell made their way to the incident site along with the advance group. The walker with the injured leg had severe cramp but was able to be walked off along with the two lost walkers. Incident closed at 4.30 p.m. The rescue group from the Borrowdale side reached Styhead stretcher box but were stood down. Weather conditions were appalling with heavy rainfall. The team were paged by the police to search for two walkers who were lost on Scafell Pike - A small group of Wasdale team members were mustered in Gosforth to search from the Wasdale side whilst a group of seven team members who were at Keswick MRTs 60th birthday celebrations approached from Borrowdale. Whilst this rescue was in hand a further call came in from an informant regarding a walker with an injured leg on Mickledore. The lost persons, who were close to Broad Crag tarn, managed to find their way to Mickledore and met up with the group with the injured leg and waited for the team. Incident resolved at around 4.30 p.m. The team were paged by the police to search for a missing father and mother who had set off to walk from Ennerdale to Wasdale and failed to turn up at their car in Wasdale. The couple were in their 50's and were reported to be experienced but with light clothing. They were from Wigan and their son raised the alarm. They had apparently got lost in the woods and eventually checked into the Blacksail Youth Hostel (hut) but had then left sometime after 11.00 p.m. to walk over Blacksail Pass to their car in Wasdale. The police had already phoned round all the hotels, farms and B&Bs in the Wasdale valley. Both Cockermouth MRT and Wasdale MRT were involved in the search. Wasdale full callout was at 5.22 a.m. The missing couple and their dog were eventually found safe and well by the Wasdale Search dog and Handler on the descent path from Blacksail at around 7.00 a.m. . They were surprised to see the team as they had left the Youth Hostel at 5.30 a.m. to walk back over. There were approximately 15 Wasdale team members including the Wasdale / SARDA search dog handler on the rescue. The incident was closed at around 8.30 p.m. with the missing persons returned to their car at Brackenclose road end. The team were alerted by the police to search for a missing 48 year old father and son (14 yrs) and friend (13 yrs). They had set off from Langdale earlier that day as a group of five to climb Scafell Pike. One father and one of his sons (11 yr) turned back at Angle Tarn at 2.20 p.m. The others carried on up the mountain. By nightfall the other father became very concerned and contacted the police to call out mountain rescue. Wasdale MRT called in Langdale, Keswick and SARDA to assist. The missing persons managed to contact the informant at around 10 p.m. to advise that the had got safely off the mountain at 7.00 p.m. and were making their way back to Langdale by taxi. Presumably this was the earliest that they could get a message back. There were approximately 16 Wasdale team members involved including a Wasdale search dog handler in addition to the other Keswick, Langdale and SARDA resources. The team were alerted to an incident on Styhead Pass. A lady in her 40's had fallen and had a suspect broken ankle. She was on the Wasdale side of Styhead on the corridor route by Skew Gill. The informant had run down to one of the B&B's in the valley to raise the alarm. The team headed for the incident but as they arrived at Burnthwaite Farm they were advised that the Keswick MRT were already on the mountain and dealing with an incident at Styhead that had been phoned through to them an hour earlier. There was some concern that there might be two separate incidents so further details were sought. Eventually it was established that there was only the one incident. The group who were from Bedford had sent two of their party to raise the alarm, one to Seathwaite and one to Wasdale. Presumably the Seathwaite runner managed to get a mobile signal from the Seathwaite side which Keswick responded to. Wasdale responded to the Wasdale alarm. Wasdale team stood by at the bottom of Gable in case assistance was required. The casualty was carried down to the Great North Air Ambulance that had managed to land a couple of hundred meters from the casualty location and was flown to West Cumberland Hospital. Whilst all this was happening a further call came in to Keswick team (hence the need for Wasdale to stand by) to respond to a '999' call for a missing 4 year old in Borrowdale. Whilst arrangements were being made by Wasdale MRT to send an additional SARDA dog handler across to help, the missing child was found and the teams were stood down. All in all around 16 Wasdale MRT were involved in the rescue and the base was closed at around 9.00 p.m.
Police paged the team with regards to a '999' call for a missing group of 10 walkers who were late back from their walk. Whilst the team leader was gathering information the police were notified that the missing group had turned up safe and well so the callout was cancelled. Not recorded as incident but as a (c) as action was not required. Whilst the team were ascending Brown Tongue for incident 42 they overtook a group of 11 who were doing the 3 peaks challenge. (less than ideal conditions for the challenge). On the descent from Lingmel Col with the 3 rescued walkers, the team met this group of 11 making their way very slowly down from the summit of the Pike. They had been unable to reach the summit due to the very high winds and driving rain and turned back just before the plateau. The group decided to tag on the back of the team. It soon became obvious that their progress was very slow and they still had to navigate through Hollowstones (very easy to wander off the path in bad weather). One of the Wasdale members decided to wait for them and lead them through to 'Y' junction where the path is well defined. Their progress became even slower as one of their group had bad knees and they had climbed Ben Nevis earlier that day. They eventually arrived at the 'Y' junction at 1.00 a.m. (still in thick cloud but now on a descent path). The group and walker with the bad knees were now happy to carry on down at a slow pace and were out of danger so were left to make their own way down. Not recorded as an official incident. Whilst the team were starting the search for incident 42, a second call came in concerning a further group that were long overdue on their return to Wasdale from ascending Scafell Pike. The team leader put this incident on hold allowing additional time for this group to turn up. Whilst ascending the fell, the advance search group came upon the missing party making their back down the mountain. Incident closed but not recorded as an official rescue. The team were paged by the police to respond to a mobile '999' call from three male walkers from the Lincoln area who were lost and crag fast in the Broadcrag area. A limited callout was made and around 10 team members attended. The walkers had left the bottom of Hardknott Pass earlier that day and were kitted out for overnight camping. The cloud was down to 1,000 feet and it was heavy driving rain. They had strayed off the summit path and were on steep ground overlooking Styhead Tarn. When the team eventually located them they were high on the northern crags of Broad Crag. Finally located by their lights and whistles at around 10.00 p.m., they were given helmets and roped down the crags to safety. They were unhurt and were able to be walked off the mountain back to Brackenclose on the Wasdale Head side. They were off the fell and taken back to Gosforth by 2.00 a.m. and returned to their car at Hardknott in the morning by staff from the Bower House Hotel in Eskdale who kindly put them up for the night (what was left of it) in their conference room. Incident closed at 2.30 a.m.
Police paged the team to respond to a '999' call from two male walkers who had become lost descending from the summit of Scafell Pike - the team leader called them on their mobile phone, established that their location was in the Piers Gill area and talked them both back down to Brackenclose at Wasdale Head. Not recorded as an official incident as wheels didn't roll - incident closed at 8.00 p.m.
Police paged the team. Two people (adults) were using a mobile phone to report that they were lost on Scafell Pike. No-one was injured but they were requesting support from the mountain rescue. After a little while the Team Leader was able to establish contact and had a conversation in which he established their location as near the top of Piers Gill. He gave them directions to walk over Lingmell Col and down Brown Tongue, ringing a couple more times as they made progress. It was clear they were going the right way and were likely to make their way off Ok so the Team Leader stood the incident down and informed the Police at 7.30pm. No team members left home and so not recorded as a full incident, but reported here an (a) to inform people how many times the '999' is being used. Call from the Police to respond to a '999' mobile phone call from a local man who was lost somewhere on the fells above Eskdale in the Blea Tarn area. When questioned he advised that he could see a large tarn with a house by it (suspected to be Burnmoor Tarn). He had set off from the Fisherground campsite. After waiting a short time to see if he could make his own way down, a limited call out was instigated. The man was found and the incident was stood down at 10.00 p.m.
returned to base, closing the log around 6.00 p.m. Call direct from Wasdale Head Hotel. A group of 3 people doing the 3 Peaks reported long overdue. just rung them to say they were in the wrong valley. Incident stood down at 10.40pm, with only two team members involved. Group of 17 on a Duke of Edinburgh award expedition were descending to Wasdale Head via Sprinkling Tarn when one of their party, a 17 year old girl suffered a suspected broken ankle. The group were very well equipped and erected a tent. They raised the alarm by '999' from Styhead. The call went to the Police and then to Keswick MRT who handed the job over to Wasdale. 18 team members attended and stretcher carried the injured walker back down to Wasdale Head where she was transferred by ambulance to West Cumberland Hospital in Whitehaven. The casualty was off the fell by 8.30 p.m. and the incident was closed at around 9.00 p.m.
Whilst searching for the collapsed walker a further group of four walkers were found sheltering in the Mickledore stretcher box. They were subsequently reported missing by the police but fortunately the team had already found them and escorted them off the mountain. Whilst whilst the team leader was dealing with incident 7:36 he had been contacted by the police regarding a group of 3 -Peakers who had set off from Seathwaite and were overdue. Whilst gathering information on 7:36 the police called back to say the missing walkers had turned up. Recorded here as an (a) - i.e. no team response required. Wasdale MRT was called to rescue a young male walker who had collapsed on the summit of Scafell Pike. He was in a party of three who were doing the Three Peaks Challenge. The three walkers were all in the twenties and from outside the area. One of the party had become separated from the other two whilst he was trying to get help from his mobile phone. He had an altimeter watch therefore no grid reference was available but he could give an elevation. [It's worth noting that these watches can be up to 100m out due to air pressure variations if they've not recently been reset. The team searched where the party said there were but did not find anyone. The team widened the search and at 3.45 a.m. the collapsed walker was found on the Eskdale side of the mountain. He was given food and warmed in a bivvy tent and could eventually be walked off the mountain down to Wasdale Head. After a further search the third missing walker was located. He was assisted back up to the summit and also walked off the mountain. Whilst searching for the collapsed walker a further group of four walkers were found sheltering in the Mickledore stretcher box. They were subsequently reported missing by the police but fortunately the team had already found them and escorted them off the mountain. The team had significant difficulty getting the rescue vehicles back down the valley due to the severe congestion on the road from Three Peaker challenge vehicles parked up. 20 team members were involved and the incident was closed at 6.30 a.m.
Organisers of a group undertaking the 3 Peaks challenge reported 2 walkers missing to the Barn Door shop. The large group had left the summit of the Pike and the two missing walkers had walked off in a different direction. It was probable that they had become disorientated and headed of in the wrong direction turning left at Mickledore and heading down into Eskdale. The two missing walkers turned up at Boot in Eskdale at 2.30 p.m. The team were not alerted but a team member was involved checking that the walkers had turned up. Team paged by police to rescue a walker who had suffered a soft tissue injury to his knee. The injured 47 yr old walker was accompanied by two walkers, one in his late teens and the other early 20's. The group of 3 from the North-east had set off from Eskdale to climb Scafell Pike. They called '999' from their mobile phone. 13 Wasdale team members attended but due to the long carry down and shortage of team members, assistance was requested from the Duddon & Furness team who arrived with a further 12 team members. Great North Air Ambulance were requested but could not provide a helicopter. A Sea King was tasked from RAF Boulmer which landed on the summit, lifted the casualty, the other two walkers and 3 team members and flew them to the valley bottom before taking the casualty to West Cumberland Hospital in Whitehaven. The two uninjured walkers were taken back to their vehicle in Eskdale by one of the team members. Incident closed at 9.30 p.m. The team asked by a local farmer in Wasdale to help search for a cow (in calf) that had not been seen for two days. 4 Team members and a search dog checked the low fell areas in and around Burnmoor Tarn that evening but the missing cow was not found. She was subsequently found a few days later by the farmer. She had died as a result of a tumble fall. The unborn calf had also perished. Team paged by police to attend a rescue on the Screes path. Casualty was a 74 year old lady from Liverpool who had taken a short tumble fall on the Screes path, suffering a bump on the head and bruising her back. She had walked across the boulder field before calling for help. She was given analgesia and then assisted to walk to boat (20yards), ferried across Wastwater to Cross walls and then given lift back to her car in Eskdale. There were 18 team members on the rescue including the boat squad. The incident was closed at 3.15p.m. Message from the police to contact them regarding a rescue. A couple from the north-east were undertaking a trial for the 3 peaks challenge. They had left home at 10.00 a.m. that morning and had failed to report in that they were back down. The team leader took the call, gathered details but was able to stand the incident down at 10.35 p.m. with no further action necessary when the missing persons turned up safe and well. Not logged as an official incident as no action was taken. Message from the police regarding a female walker in her early 40s who had collapsed in upper Eskdale. The Team Leader called in Great North Air Ambulance and he, along with a team doctor were flown to the casualty site. Initial indications were that the air ambulance would be able to land close to the casualty on level ground. However the casualty was on steeper ground so, after treatment for an adverse effect to prescribed medication, the lady was assisted to the helicopter and flown to West Cumberland. 17 team members were involved in the rescue and the incident lasted 4 hours. The base was closed at 10.00 p.m. The team were paged by the police following a '999' call from a male. His female partner had not returned from a walk on Harter Fell. Whilst the Deputy Team Leader was gathering details from the informant, the missing person turned up safe and well. Logged here as an alert and not an official record. The team were paged by the police to try and find a local lady in her early 70s who had been walking with her daughter on Muncaster Fell and become separated. The last time she had been seen was near the summit at 2.15 p.m. The lady was a mild sufferer of Alzheimer - 20 team members were involved including a Wasdale Search dog. Duddon & Furness MRT were also involved in the search and more search dogs were called in from around the county. Staff from the Muncaster Castle Estate assisted in the search. There were a number of sightings of a lady matching the description but they failed to materialize into anything positive. The lady was eventually located in Ravenglass village safe and well and reunited with her daughter. Incident was closed at around 7.30 p.m. The boat training night planned for that evening was postponed. The police paged the team to rescue a local farmer who had come off his quad bike and broken his leg up on Muncaster Fell. The Air Ambulance had also been called to the incident. 15 team members attended the rescue. The air ambulance managed to get to the farmers location before the team arrived. The incident was closed at 1.00 p.m.
Wasdale MRT were asked to assist a 34 year old male fell walker who had taken a wrong turning when descending from Whin Rigg, at the top of the Wasdale Screes. He had become crag fast in Great Gully in a particularly inaccessible area and local knowledge of this very difficult and unstable ground was essential to reach him. An attempt to reach him by climbing up the gulley was found to be impossible due to the wet, slippery and very unstable nature of the rock. The rescue was therefore moved to an ascent via the ramp and terraces to enter the gulley from above the crag fast walker and descend by abseil to his location. He was found to be uninjured and was lowered down the gully using 200 metres of rope before being taken back to his vehicle at Wasdale Head. The Wasdale Screes are extremely unstable and subject to constant rockfalls. This is the second rescue in 4 weeks from almost exactly the same place for exactly the same reason; a navigational error ending up in the middle of the crags unable to go either up or down. 17 team members were directly involved in the rescue which took 5 hours. The base was closed at 10.00 p.m. Photographs and video footage of the rescue. The police paged the team to attend to an incident after a report of a 59 year old male walker having fallen from Broad Stand. Broad Stand is a deceptively difficult route between Scafell and Scafell Pike. For many years it has been one of the accident black spots in Wasdale. Great North Air Ambulance was used to ferry 4 team members to the scene before an RAF Sea King helicopter from RAF Boulmer arrived to ferry more team members to the accident site. The casualty was treated on scene by a doctor from the Wasdale team before being flown direct to West Cumberland Hospital at Whitehaven. Unfortunately the casualty failed to recover from his injuries. 24 teams members were involved in the rescue which lasted 4 hrs. Whilst the team were assembling for incident 25, The Wasdale Head Hotel called the base to advise that a minibus had turned up with only the driver, the rest of the party were on Scafell Pike somewhere and long overdue. Whilst concentrating on incident 25, the Team leader decided to sit on this incident and eventually they turned up. No real action was taken apart from phone calls so it has been recorded as an (a). Whilst the team were assembling for incident 24(a) Langdale Ambleside MRT (LAMRT) called the Wasdale team to assist with the search for a missing group of 14. Two walkers were known to be suffering ankle injuries but we believed the group was still together, albeit moving slowly. Contact had been lost but it was believed the group were coming down Mosedale. What LAMRT didn't know was whether they had lights, or injuries needing stretchers. Two Wasdale team members found various members of the group in Eskdale and stayed long enough to confirm that all the group were off the hill. Some had minor ailments but were advised to self treat or seek medical attention. We turned the LAMRT vehicle around at Wrynos. The Wasdale incident was closed down around 10.30 p.m.. Around 12 team members were involved in this incident. Following a mobile '999' call, the team were paged by Whitehaven Police to rescue a 77 yrs old female with a broken ankle in Bluebell woods on the Muncaster Castle Estate. The lady was found with some difficulty as she was not on one of the designated paths, however as soon as she was located, her ankle was treated and she was stretchered through the woods to the waiting ambulance and taken to West Cumberland Hospital in Whitehaven. Only six team members attended this rescue due to the incident 23. Following a mobile '999' call, the police paged the team to attend to a 73 yr old male walker who had collapsed on the summit of Great Gable. The man, who was local, had been walking with a friend and collapsed at he reached the summit and became unconscious. The team called in the RAF to assist but unfortunately the man did not recover. He had suffered a heart attack. He was stretchered down to Styhead Pass where the cloud base was and the RAF airlifted him back down to the Wasdale Head. There were20 team members involved. The incident was closed at 18.00 hrs. A '999' call came in from a worried parent regarding three 20 year old male walkers who had phoned home to say they were struggling coming down the mountain. They had been on Scafell Pike. They had reported to another parent that they could see a Tarn and were heading for it. Following a number of telephone calls to the informants, the team Leader decided to wait a further 2 hours before taking action. The missing walkers turned up safe and well at 4.48 p.m. and the incident was closed. This incident is recorded here for information only and not logged as a formal incident. Whitehaven Police paged the team following a mobile '999' call from a group of walkers lost on Great Gable. The group of 4 from Manchester had descended via Westmoreland Crags and got themselves onto the loose scree at the top of Great Hellgate. Unsure of their location and unhappy about the descent they called for help. A limited callout was made and around 10 team members assisted the group back over the top and down to Styhead pass where the Keswick MRT assisted in the final walk down to Seathwaite. The incident was closed at around midnight. The police paged the team to rescue a fallen climber in Eskdale. The man from outside the area was solo climbing on Bell Stand Crag above the old Quarry in Eskdale. He slipped and fell approximately 5m down the crag and then tumbled down the slope at the bottom. He sustained a scalp wound, chest injuries and a broken ankle. Although a RAF helicopter was called in to assist, this was subsequently stood down due to the nature of his chest injuries. He was evacuated by stretcher to a road ambulance and taken to West Cumberland Hospital where, nearly a week later, he is still recovering. Around 25 team members were involved in the rescue and the base was closed at 10.30 p.m.
Cumbria Police paged the team regarding a mobile '999' call from a group of 11 students who lost on Scafell Pike, believed to be in the Piers Gill area. Due their condition (cold and very wet) and the weather conditions forecasted that night (gales and heavy rain preceding the snow) the team were mobilised immediately. 22 team members attended the rescue. Whilst the two advance landrovers with 5 on board headed up the valley, the minibus was held back to muster more hands as this rescue had the makings of developing into something more demanding. The backup vehicle with 9 on board was tasked with bringing up two stretchers, team first aid kit, more warm clothing and casualty bags (similar to a sleeping bags but larger). When the lost walkers were located, high up on the northern descent path of Scafell Pike, approximately100 meters above Lingmel Col, it was established that the group of 11 were in fact two groups. A group of 7 male and female students in the 20's from Sheffield University Walking Club plus a group of 4 from Baseldon, Essex. Both groups had become lost and decided to stick together and then call out mountain rescue. The 11 were found sheltering behind a large boulder. The Sheffield group were reasonably well equipped but overall there was insufficient survival gear for the full group a night on the Pike. Although very cold and wet, they were fit to walk down unaided so the stretcher parties were turned back. The groups were taken to the Wasdale Head Inn where they were warmed, sorted and collected by their support vehicle. The incident was closed at 9.30 p.m.
Whilst the team leader was still at the base, a further call came in from the police regarding a missing male walker. Two males in their early 20's from the Isle of Wight had set off from Brackenclose to climb Scafell Pike via Mickledore. They reached the summit at 11.30 a.m. but on their descent became separated in low cloud. The one who raised the alarm had himself found it difficult to navigate off the fell but got back to his car at 3.00 p.m. He was actually there when the team arrived for the fatality incident. His friend who was missing did not have a compass nor map and had limited wet weather gear, nor a rucksack. The decision was made to hold off a search until 6.45 p.m. at which time a full callout was made and SARDA and Keswick team were mobilised. The missing person turned up at 7.30 p.m. after coming down Eskdale and getting a lift back round to Wasdale. Team members were called back to Base and SARDA and Keswick were stood down. 12 Wasdale team members were involved. and the incident was closed at 7.45 p.m. The Team were paged by Whitehaven police to attend a 62 year old female walker from Whitehaven who had collapsed with chest pains. She was with her husband and another walker who raised the alarm by mobile. They were located 200 metres above the beck crossing at Brown Tongue on the Lingmel Gill side. Due to the clear diagnosis from the informant an Air Ambulance was requested and shortly after an RAF Sea King was requested and was on its way. As the team made their way up the fell, further information was received that she had failed to recover. The Air Ambulance flew the team doctor to the scene to confirm that she had passed away and the aircraft returned to their base. The RAF helicopter was stood down and returned to base. The lady was carried by stretcher to Brackenclose. The incident was closed at 5.10 p.m. with 16 team members involved. The Team were paged by the police following a mobile '999' from the summit of Scafell Pike. Two walkers had set off from Brackenclose and were unsure ho to get off the mountain in deteriorating weather. It was raining and there was cloud down to Lingmel Col. The team leader talked them down to the col advising them on bearings whilst a small group assembled at the rescue base. One team member went out to check the vehicle location. The lost walkers eventually got down safely some hours later. Recorded as an (a) type record rather than an official incident. The Team leader was contacted by the Police following a '999' call from the phone box at the bottom of Hardknott Pass. A family of 5 had driven over Hardknott Pass and when they passed the Roman Fort (at 3.45 p.m.) the father, 13 yr old son and 5 yr old daughter got out to walk to the fort and then back down the fell to the bottom of the Pass. The mother drove the car to the bottom (sometime later) but when she got down there was no sign of the party. She had driven back up to the fort and back down again. When darkness fell she called the police. The team were mobilised and two Eskdale team members went straight to the bottom of Hardknott. Whilst team members were gathering the missing group turned up safe and well at 7.30 p.m. The missing group had walked down the fell and instead of waiting at the bottom, carried on walking down the road to try and find the car until they got to the Dalegarth Railway Station (2 miles) and then walked back to the telephone box. The team were very relieved that it did not end up as a repeat of the previous rescue. Normally the team would sit on an incident such as this until later to allow the missing persons time to make their way out but when young children are involved a more immediate response takes place. Base was closed down at 8.00 p.m. The Team Leader was contacted by the police regarding a family of 4 who had failed to return to their car after climbing Scafell Pike. The father and mother along with their 5 year old and 14 month old sons had set off at midday from Brackenclose. Another group of 3 walkers left Brackenclose at the same time and walked up the mountain with them (coincidentally both groups were from Cornwall and up on holiday but not together). The combined group of 7 climbed to the summit of Scafell Pike via Mickledore. They all left the summit at 4.00 p.m., and although it was late, the young family had seemed happy with their intended descent route. The party of 3 returned to the valley bottom independently but when the young family's car was still parked up after nightfall, the group became concerned and decided to walk back up the mountain to see if they could see their lights. When nothing was seen they called out the team via the Police. Following a major search involving over 40 team members from Wasdale, Keswick, Duddon & Furness, and 4 SARDA search dogs, the family were located just after midnight in the bottom of Piers Gill at the bend by the waterfall pitches (the same location as incident 12a). Although tired, cold and wet the family were well equipped and out of the wind and driving rain. Conditions on the mountain were severe with low cloud, visibility down to 30 feet, strong winds and driving rain. The family were brought out of the Gill and due to the cold and wet and tiredness, the 5 year old son was brought down by stretcher. The family were off the fell at 3.30 a.m. and taken to the Wasdale Head Inn for food, drink and accommodation kindly supplied by the owner. The incident was closed at 4.30 a.m. 19 Wasdale team members, 9 Keswick, 16 Duddon Furness, a 4 search dog handlers from SARDA Lakes. (reduced but sufficient numbers due to half term). The route out for the casualties is shown on the attached GPS trace. The stretcher party were out of the cloud half way down Lingmel Nose but wind was extremely fierce. The incident seemed to capture the media's attention and was covered by a number of regional TV stations and the Times. Any details in the press with regard to individual names and home location were not supplied by the Team. The website has received the greatest number of hits since it started with 945 page views for the week and 240 visitors to the website on the morning following the rescue. The Team Leader took a call direct from one of the team members at the Head on Friday evening, about 8.40pm. An informant at the Hotel was reporting a father and 13 yr old son long overdue from climbing Scafell Pike. They had last been seen at Mickledore (about 4.30pm) heading towards the summit. Reported as very well equipped and highly experienced. They turned up at the Hotel before 9.00 pm and the team member spoke to them. Not an official incident but for the interesting bit......i.e the fact they'd become lost and descended into Piers Gill by mistake. Apparently they'd gone down Piers Gill until stopped by vertical pitches and had climbed out on the side - this being a serious, steep rock/grass, approx 200ft climb!!! They were still visibly shaking from the experience when they arrived back at the Hotel. The team were paged by the police to respond to a mobile '999' call from two local male walkers, in their late 20's and early 30's on the Corridor Route. They had left Brackenclose earlier in the day to climb the Pike but had got to Lingmel Col then decided to head off back down via Styhead. Just after crossing Skew Gill, one of the walkers went over on his ankle and could not walk any further. The team reached the casualty at 3.15 p.m. and stretchered him back down the mountain to Gavel Nease, then onto Whitehaven Hospital in one of the doctors vehicles. 16 team members were on the hill with a further team member on base control. Weather was fair with light showers. Photographs of the rescue are reproduced here. The incident was closed at 6.00 p.m. The team called out to search for a lady walker in her late 20's who had called the police on her mobile to say she was lost somewhere in the Scoat Tarn area (west side of Red Pike in Wasdale). Around 12 team members searched the area and located the lost person at around 10.30 p.m. in the upper reaches of Netherbeck, below the Scoat tarn area. She was cold and wet but otherwise safe. She was walked off the mountain and the incident was closed at around midnight. She had been heading for Buttermere but had become disorientated in the low cloud. The team were paged by Workington Police to respond to a '999' mobile call regarding a male shout followed by a dog barking for 20 minutes. Two separate telephone calls came regarding this incident so the team were called out. The informant and his partner were on Slightside under Horn Crag when they heard the shout, high up on the ridge. When this was followed by the dog barking they became concerned and made their way off the mountain to get a mobile signal. The shouts were at 2.20 p.m. 21 team members went on the fell whilst team members on base tried to contact the informants on both phones, leaving messages. The informant eventually got a mobile signal and called the base. Both calls had been made from the same party. The base made contact with local farmers to rule out a farmer and sheep dog. It was eventually established that the local foxhounds were out on the fell on a hunt and were on Slightside at the time the shouts were heard. The incident was stood down at 6.45 p.m. when it became clear that there was no-one on the fell. Team members returned to base and the incident was closed at around 8.00 p.m., recorded as a well intentioned false alarm. Update 7.03 p.m. - the missing 69 year old walker turned up safe and well at the Old Dungeon Gill Hotel (ODG). The group of 16 set off from Scafell Pike summit at 1.30 p.m. heading back down to Broad Crag Col. When the missing person failed to catch the group up, 4 of the group went back up to the summit. They were last heard of at 3.30 p.m. on the Corridor route. The missing person turned up but the group of 4 are still somewhere on the mountain, most probably well out of the Wasdale area. As the group were heading for Langdale, the incident has now been passed over to the Langdale Ambleside team. The Wasdale involvement closed at around 7.30 p.m. and although the team leader was continuously on the phone from 5.00 p.m., this particular incident has been included on the website as a 9(a) - i.e. noted for information but not logged as an official Wasdale incident as 'wheels did not turn' and team members did not venture onto the fell. The team were called out by Cumbria police to rescue two walkers on Great Gable. The man and woman had been to the summit at 2.30 p.m., then again at 4.00 p.m., they believed they were at Beck Head and raised the alarm via a '999' mobile phone call. They were in cloud and had a small torch. The team leader initiated a limited callout and 11 team members were deployed. One group up to Beck Head and the other to Aaron Slack via Sty Head pass. When the lost persons were neither located at Beck Head nor Windy Gap, a full callout was initiated to explore Kirk Fell, Mosedale and Blacksail. At around 8.30 p.m. the lost couple turned up at the Fox and Hounds at Ennerdale Bridge. They were safe, well and tired (Ennerdale Bridge is 10 miles from the head of Ennerdale Valley). We suspect that they probably managed to get a lift to the village. Weather conditions were cold but clear up to the cloud base which was local to the tops. There were approximately 18 team members involved from the Wasdale team and support from the Cockermouth team. The incident was closed at 10.30 p.m.
[When two team members got back to the Wasdale Head Inn, they went to the bar and were greeted by a female walker from York who asked if she could buy them a drink. They were delighted, took up her spontaneous offer, and immediately converted it into a pint of Gable Shandy and pot of tea (driving) - many thanks Theresa as we said we would give you a mention]. The team were called out by Cumbria Police to rescue an injured person on Kirk Fell. The 53 year old male walker was near the summit of Kirk Fell on the Ennerdale side, towards Blacksail Pass. The man, his son and girlfriend were in a steep gulley which leads from Baysoar Slack when he slipped on the ice and sustained a serious head injury. The son raised the alarm by running down to the valley bottom and then returning to the accident site. 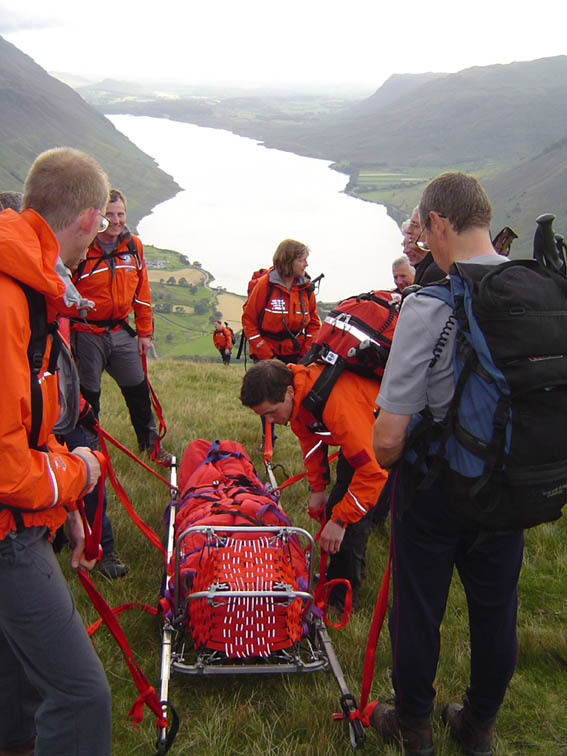 19 members of the Wasdale team were involved in the rescue including the four team doctors. The cloud was down to 1,000 feet and casualty location was 1,800 feet so helicopter evacuation was not possible. Freezing level was around 700 feet which had coated all the paths and rocks with a thin layer of verglass ice, extremely slippery underfoot. 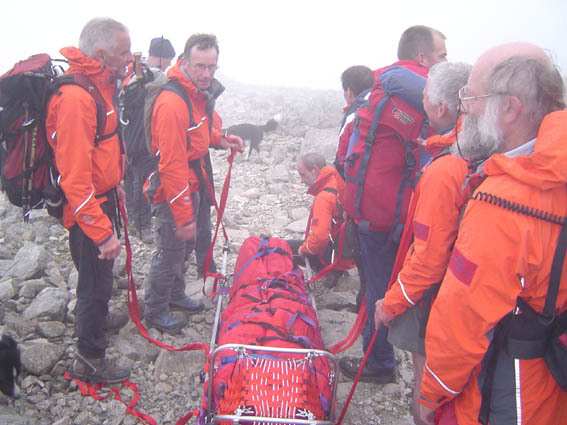 Due to the serious nature of his injuries, the team leader called in assistance from the Cockermouth Mountain Rescue team (around 8 - 10 team members). In addition a Sea King helicopter was called in from Royal Navy Gannet, Prestwick to land-on in the Ennerdale Valley bottom and await the stretcher party. The injured walker was airlifted at around 8.45 p.m. to be flown the 10 minute journey to West Cumberland Hospital. The incident was closed at 10.30 p.m. Thanks go to The Royal Navy and Cockermouth Team for their assistance. Post incident (29/12/06) - The critically injured walker was subsequently taken to Newcastle hospital but tragically failed to recover consciousness. The team could not have done more; the team's condolences go out to his family and friends at this very sad time. Request from Cumbria police to search for a pair of male walkers (30 and 18). They had set off from Brackenclose to climb Scafell Pike via Hollowstones and Mickledore. They completed the walk to the summit but became lost on the way back down. The team leader waited until 9.30 p.m. before calling the full team out. However after assembling at the base the two walkers managed to get a signal out to advise that they were making their way off the fell. One team members was waiting at their vehicle so as soon as they were safely off the fell the incident was closed at around 10.30 p.m.. The base was close at 10.45 p.m. and there were 24 team members on the incident plus a search dog. Request from Cockermouth team and Cumbria police to respond to a '999' call from a father and son who had set off earlier that day to walk from Wasdale to Ennerdale YHA via Netherbeck / Haycock. The became disorientated and ended up at Red Crag on the Blengdale side of Haycock. They could see a light in the far distance (Skalderskew Farm). The team leader phoned the farmer who confirmed that he could see their lights so when they turned up at the farm, the team leader drove up to collect them and drive them round to Ennerdale youth hostel as a Xmas goodwill gesture (there would be no taxis due to Xmas functions). Rescue base was closed at 9.00 p.m.
Request from Cumbria police to assist in the search for a female in her mid thirties, reported missing that morning from the Thornhill area. The team assembled ready to begin the search in fields and footpaths when the call came through from the police that the missing person's body had been located in the River Ehen. The team were asked to recover the body. 20 team members were involved in the search. The incident was closed at 4.50 p.m.
Request from Cumbria Ambulance service, via the police to assist with a male casualty reported to have collapsed near the Cold Fell road. Team attended and assisted Great North Air Ambulance crew who then flew the casualty to West Cumberland Hospital with suspected heart failure. The group's location was on the path on the west side of Whoap Fell. Around 15 team members attended the rescue. Unfortunately he did not survive his collapse. The two companions were walked off the mountain back to the Cold Fell road. The incident was closed at 12.30 p.m.
Three male walkers were benighted on the Scafell range in severe weather conditions and although they had telephoned their wives to let them know that they were happy to bivvy out until the morning, due to the medical history on one of the walkers, the Langdale and Ambleside Team were called out to locate the group. Wasdale MRT were called in to search the Scafell Pike area. The position of the lost walkers was identified as somewhere between Esk Hause and Angle Tarn, just as the Wasdale team were ready to deploy. Team members were stood down shortly after the callout and the base was closed at 1.00 a.m. Call from Keswick MRT to assist in the search for a missing 69 year old male walker who had set off from Hawes End to walk Catbells the previous day with his dog and failed to turn up at home. The man was on holiday with his wife. Keswick MRT had been out all night and were now extending the search as they were very concerned about his condition. 21 Wasdale team members turned out and drove to Keswick to assist. As the team arrived at the Keswick Base a body was found by a walker in the area between Catbells and Newlands. The male fitted the description of the missing person and the search was stood down. Cockermouth MRT recovered the body. The Wasdale team returned to Gosforth and the base was closed at 2.30 p.m. 150 rescuers and an RAF helicopter were involved in the search. Whitehaven Police paged the team to rescue three adult walkers who had become lost on Scafell Pike. They had driven up from Essex that morning and set off to climb Scafell Pike at 1.00 p.m. They had reasonable equipment and lights but on their descent they became disorientated so called the police on their mobile. The team leader was unable to contact the group by mobile but had sufficient information to be able to establish where on the mountain they might be. They had given a height of 1,400 feet to the police from their location, presumably from a GPS. A quick recce in the valley bottom by one of the team members who lives close by established that they were not on the Brown Tongue descent as no light could be seen, however their single light was seen from Gavel Knease (bottom of Great Gable) at a location near Greta Gill. A limited call out was organised and the lost walkers were located and brought back down safely. This was not a night to be on the mountain as it was the first snow of the winter. The group had ended up lost around the top of Piers Gill (now our most popular location for groups to become lost). They had eventually made their way down the corridor route until they came to the rock step at Greta Gill where they made a further navigational error and by-passed the rock step and proceeded down the eastern edge of Greta Gill. At this point their lights packed up bar one and the temperature fell below freezing so they made the '999' call and sat tight. There were five team members involved in locating and walking them back down the mountain and the incident was closed at 2.30 a.m.